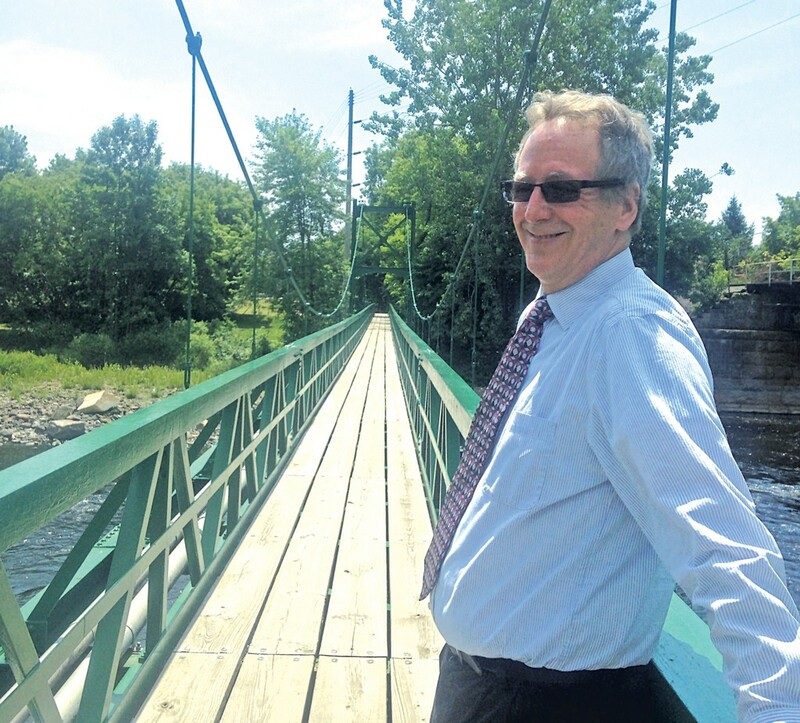 Plattsburgh, N.Y., Mayor Colin Read left city hall and walked toward Lake Champlain on a sweltering July morning. He passed railroad tracks, the Saranac River and the city sewage treatment plant before arriving at Plattsburgh City Marina, which has a spectacular view of the water and Vermont's Green Mountains. Read would like to make that stroll more pleasant, with new walkways, signs and benches along the route. "We call ourselves the Lake City, but to be honest, it's actually kind of difficult for most of our residents to get to the lake," Read said. He pointed to an 11-acre area by the marina that he says could one day become home to a museum and perhaps a hotel and a splash pool for tots. The city has issued a request for proposals. Another project originally called for a $1.5 million expansion of the small city marina, which has a waiting list for slips. The mayor said a scaled-down expansion will be done by next summer, using donated docks and city employees rather than contractors. Read pointed across the lake toward the Queen City, which he sees more as inspiration than rival. "I think Burlington does a lot of things really well, and if we can emulate them, we should," Read said. The trim, curly-haired 58-year-old academic is almost halfway through his first four-year term. He's in charge of a not-so-thriving city of 20,000 that is trying to attract new investment and rebrand itself on street banners as the Adirondack Coast. But when Plattsburghers think about Read's waterfront, ambitious development plans aren't what comes to mind. Instead, they're incensed about fewer lifeguards at the city beach. The mayor inherited a financial mess in city hall — and has attacked it with aggressive cuts, rankling many. How bad was the situation? "Really, the reason I ran was because we were on the verge of financial Armageddon," Read said. The professor and former dean of the School of Business and Economics at the State University of New York at Plattsburgh, located just blocks from city hall, is teaching a real-world application of economic theory. The 101? Don't spend money you don't have. Read has merged four city departments, had the county assessor's office take over city assessments, laid off roughly 10 people and left many other positions unfilled after employees departed. Several department heads and other employees have resigned, blaming Read for plummeting morale in city hall. Last year, the New York State Financial Restructuring Board for Local Governments urged dramatic action to address Plattsburgh's deficit, ballooning pension obligations and a bounty of retroactive wages owed to firefighters after a lengthy labor dispute. The board noted the city's declining bond rating and worrisome pattern of spending more than it took in. The problem exploded in 2016, when Plattsburgh posted a deficit of $6.9 million and a property tax increase of nearly 7 percent. The gloomy financials and the prospect of double-digit tax increases helped Read, a Democrat, defeat incumbent mayor James Calnon, an independent. Read took office in January 2017. The cuts he made to the existing budget reduced the 2017 deficit from more than $1 million to $308,000, he said. This year, property taxes increased a modest 2.8 percent, the budget grew only 2.5 percent and Read expects the city to finish the year with a small surplus. Still, cuts of more than $1 million have triggered heated criticism and even an anonymously administered Impeach Mayor Colin Read Facebook page. It weaves snarky memes with legitimate beefs, such as the culled lifeguards. The page claims that Read exhibits the "signs of a sociopath" with "superficial charm'' and a tendency to "dominate and win at all costs." Some commenters have defended the mayor, including one who posted: "I think, given the unholy mess Read took on, things could be a lot worse." The spotlight doesn't bother the native of Canada, who has dual Canadian and U.S. citizenship. Read supports the relatively big-government approach of his native country but said that Plattsburgh's cuts were needed. "It's just part of the job," he said. "If you're going to change things, you can't avoid having some people who get upset." Evidently. There have been fireworks on the six-member Plattsburgh Common Council. On February 8, Democrat Becky Kasper abruptly quit, citing a "tyranny of despair" in city hall. For months, Kasper had questioned the city layoffs and department consolidations. Her feelings about Read's performance have not mellowed. "You can't just cut," Kasper told Seven Days last week. "Extreme austerity has proven to be a way of causing the demise of a community." Republican Councilor Dale Dowdle worries that the mayor is tackling the city's financial problems too aggressively. He also faulted the mayor for exaggerating. Read often says that the property tax burden could force seniors to sell their homes, for example. Dowdle disagrees. "I think that's an overplay," he said. "Most seniors who give up their homes are doing it for different reasons." Even some councilors who strongly backed Read's candidacy are now lukewarm. "Though I respect the mayor's efforts and credit him with some success, I think that the implementation of his plan has been bumpier than necessary," Democratic Councilor Rachelle Armstrong said via email. But Read still has fans on the council. Democratic Councilor Michael Kelly portrays the mayor as courageous for making needed but unpopular decisions. "It's easy to grow government. It's really hard to shrink it," Kelly said, adding: "I just feel like he's going to get the job done in Plattsburgh." The mayor took flak after a conversation he and Kelly had last year was caught on video and posted to YouTube. Read questioned union raises based on longevity. "That guy who's sitting on the back of a garbage truck, is he really getting more productive?" the mayor asked. He apologized, but the comment still resonates. "It was felt kind of hard by the guys," said Jason Keable, a heavy equipment operator and president of the American Federation of State, County and Municipal Employees, Council 66, Local 788, which represents 90 workers. Keable thinks Read would be more sympathetic if he knew what it was like to pick up 10 tons of garbage in 95-degree weather. Read doesn't let criticism dull his enthusiasm. He was full of ideas and good humor on July 16, when a Seven Days reporter joined him at several meetings and for a walk around Plattsburgh. By stabilizing the tax rate and balancing the budget, Plattsburgh can better attract private development and innovative ideas, he said. Read also wants to consider new uses for public property. Why not build a small group of affordable tiny houses downtown, he suggested to Plattsburgh Housing Authority executive director Mark Hamilton during one meeting. Walking past the city lighting department near Lake Champlain, Read said that he wants to move the facility to develop housing there. Circling back toward downtown, Read crossed a bridge over the Saranac River. He said he hopes to expand the limited trail along its banks. And at a city parking lot, Read shared his vision of using a $10 million state Downtown Revitalization Initiative grant to create green space, expand a farmers market and attract a private development. Earlier this month, the council voted to retain Burlington's White + Burke Real Estate Investment Advisors as consultants on the project. Whether he can complete these grand schemes is an open question. Critics, including Kasper, noted that the city might pass on a $1.1 million state grant for the Saranac River Trail. That would be a terrible mistake, she suggested. Last week, the common council discussed but delayed asking Read to decline the grant, which requires a local match of $232,000. Read initially supported putting the grant on hold but has since said the city should accept it and that he has negotiated a more flexible implementation. Read is generating more headlines than his predecessors, said Joe LoTemplio, who has covered seven mayors in his 33 years as a writer at the Press-Republican. "What he did last year was kind of drastic," LoTemplio said. "He eliminated four big departments. That kind of change, I've never seen anything like it." Not all residents are worried, according to the city hall scribe: "The jury's kind of still out. There's another mind-set in the city that says, 'Yeah, this city has been kind of fat and could use some trimming.'" Similarly, there is no verdict on whether Read can meet another of his goals: to attract and keep twentysomethings in a reinvigorated downtown. Katie Dowling, 24, graduated from SUNY Plattsburgh in 2016. The bartender and server at Our House Bistro sings at local clubs. The city just doesn't have enough going on, she said. "I picture Burlington as, like, a more hip place," said Dowling, who plans to move to the Queen City next year. Plattsburgh, founded by Zephaniah Platt in 1785, has a century-old city hall and retains many historic buildings. But some are vacant, and the paint is peeling on the window frames at city hall. It's certainly not Vancouver, the shiny, cosmopolitan city where Read grew up. From an early age, he was attracted to academic pursuits. He eventually earned five advanced degrees, including a PhD in economics. He was a professor at the University of Alaska Fairbanks for 15 years and dean of the business school at Central Connecticut State University before he moved to Plattsburgh in 2005 to take the SUNY business school job. He quickly grew fond of the North Country city. With his wife, Natalie Peck, Read planted a vineyard of cold-hardy grapes north of the city. They sold the wine from a downtown shop, since closed, and Read became interested in revitalization. He wrote weekly columns about business for the Press-Republican for several years and was never at a loss for ideas. In his spare time, Read tinkers with a Cessna 180 floatplane and flies it around the lake. Read has lived in the U.S. most of his adult life and became a U.S. citizen in 2010. He wanted to get involved in civic life and has plunged in as mayor. Will he seek another term in 2021? Maybe, maybe not, Read said. "If I run again, it will be because I didn't get enough done in my first four years."